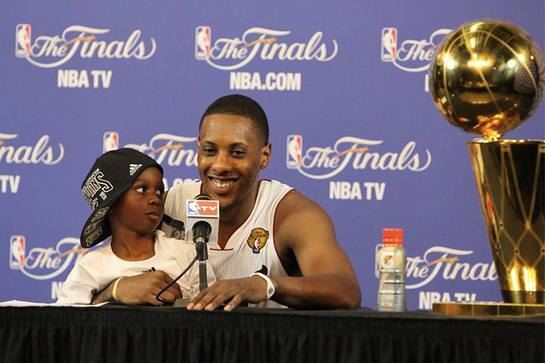 Two-time NBA Champion Mario Chalmers (Miami Heat) recently partnered with BidSpot Cares, a crowdfunding platform that raises money for charities using online games and social media. Look to the Stars caught up with Chalmers to chat about his MC15 Miracle Shot Basketball Camp; the Mario Chalmers Foundation and what sparked his interest in charity. Last night you hosted your Foundation’s fundraising event? How was it? Yeah, we had a mixer last night with a silent and live auction with all proceeds going to my foundation and the Ronald McDonald House. It was really good, but my favorite thing is hosting my basketball camp, seeing the smiles on kids faces, being there playing one-on-one with them, parents smiling and everyone leaving with something positive from the camp. The story on that is a close friend of mine – his mother died in 2006 of breast cancer, so since then I wanted to find out more about it, how we can help and just make breast cancer sufferers lives a little bit easier. And with the children’s initiatives, just keeping kids off the streets is what’s important. The hardest thing for me – growing up in Alaska – was people saying I wouldn’t make it. We don’t have a lot of celebrities coming out of Alaska, so for me to make it and follow in the footsteps of people like Carlos Boozer, Scott Gomez, Curt Shilling – people like that who came from Alaska, made a name for themselves and gave back to the community -to have my name mentioned with those people is a great accomplishment. Is there anything you’d like to ask you fans to do to support you? Follow me on Twitter, follow my foundation page and find out about upcoming events to participate in. I gotta go with Super Mario. BidSpot Cares founder Cheryl Womack explained how this unique platform works and how it can enhance a charities fundraising ability. For example, an initial ten-dollar donation gives donors VIP access to bid on or purchase amazing experiences or items from their favorite athlete or celebrity. The bids are also donations and go towards a ‘bigger story’. Look to the Stars thanks both Mario Chalmers and Cheryl Womack for taking time out to chat with us.